The wonderful thing about not freaking out about fat is that you are open to all sorts of possibilities. Consider a Tuesday night, you are nearly through to Hump day, the week is still blah! So do you really want to prepare food when, let’s face it, a heathy slug of red wine is so much more tempting. But feed the inner you is what needs to happen at some point. Well, luckily for me our supermarket (food market, call it what you want market), sells BBQ free range chicken and nice and moist it is. But chicken on it’s own, although rather enticing, needs a little something extra. 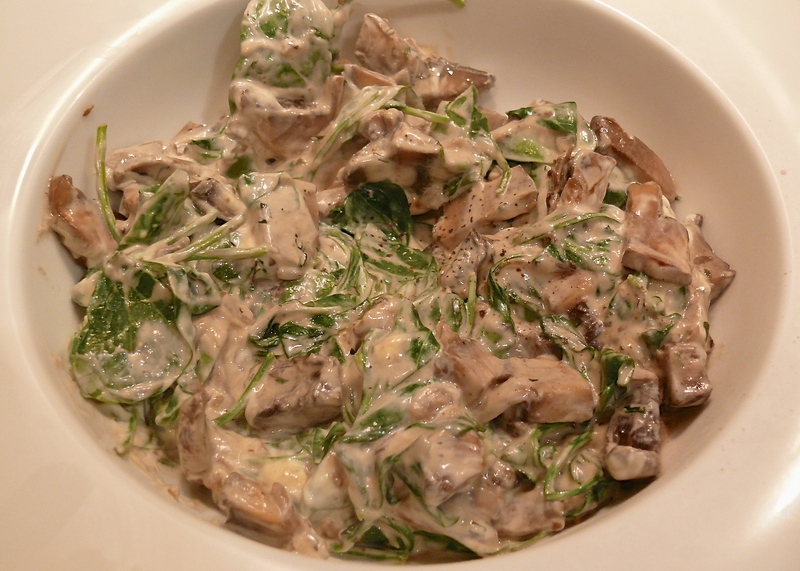 So a forage in my fridge comes up with sour cream, mushrooms and a 1/2 bag of baby spinach. Brilliant – so here we go!! Finely dice your onions and smash/crush the garlic. Add onions and garlic and fry gently for a couple of minutes. Add sliced mushrooms and cook until soft. Grate or sprinkle over nutmeg and stir. Add spinach and mix together with the mushrooms. Once spinach has wilted somewhat, add sour cream. Mix well and heat with out boiling. One final note on this recipe. It belongs in my “more or less” cooking category. This relaxed kind of cooking means it is pretty foolproof. You add more or less of whatever takes your fancy and as long as you don’t let the sour cream boil you are pretty much ok!